the xray doctor: xrayoftheweek 8: is this a normal chest xray? xrayoftheweek 8: is this a normal chest xray? 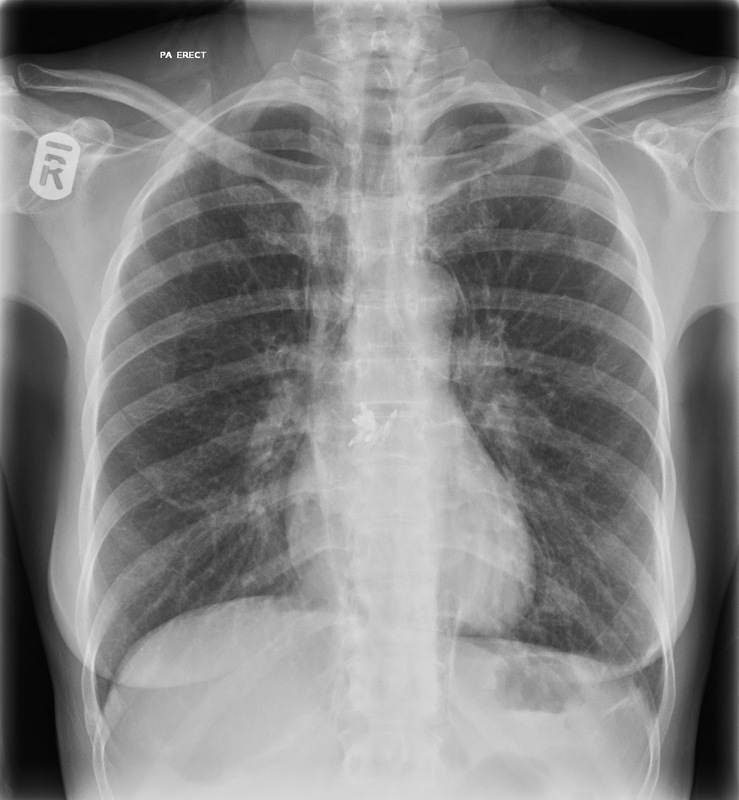 Have a look at the latest #xrayoftheweek: is this chest xray normal? (hint: it's not going to be if its on this website!). This is another typical FRCR 2b exam film - but at the easier end of the spectrum. On this xray, there is gas in places it shouldn't be. There is free gas in the mediastinum and in the root of the neck. It's a tricky finding but there is also a shallow left sided pneumothorax. Some high density metallic clips are also projected over the centre of the cardiac shadow.The lungs are otherwise clear. This is a coronal image from the CT scan they had after the CXR, with oral contrast. This confirms the free gas in the mediastinum and a shallow left pneumothorax. There is thickening of the wall of the mid-oesophagus where the clips are seen. There is no leak of the oral contrast. This patient had attempted endoscopic mucosal resection of an oesophageal lesion with subsequent perforation which led to a pneumomediastinum. The presence of the clips with pneumomediastinum adds up to an xray with the whole story on one image!